When Should You Prune Trees? Tree Service Tips – When should you prune trees? We are often asked the question, “When should I prune my trees?” There is no one correct answer. Instead there are lots of circumstances and situations to consider. Someone once said, “Anytime you have the time and the shears to do the work.” Well, that’s only partially true. The tool part is true. It’s actually a fairly complicated question. Garrett’s answer would be, “it depends.” Ok, that’s a politician’s answer but why? Because with the internet, information about every subject is overwhelming and someone can either oversimplify or take the rules too seriously and get into trouble with this complicated subject. So, when should you prune trees? Evergreen or deciduous or conifer? What species? Elm or Maple or? It makes a big difference. Fruit tree, ornamental or shade tree. Are you taking out dead wood only, or both live and dead wood? What part of the country do you live? We are in the SW part of Washington State. Are the trees healthy, unstressed specimens? What are the ages? It makes a difference if you are structurally pruning shade trees. Check Out Some of Our Other Tree Services! The best time would be late spring after the initial surge of growth. Most trees grow from spring to early summer. After that, they slow down considerably. Remember all cuts are wounds, so pruning during this time gives the wound a chance to compartmentalize. Because of Dutch Elm disease, the pruning window for Elms is from September through March. Cuts made during the summer can attract the beetle that carries Dutch Elm disease. You can take out dead wood any time of year on any species. Prune hazardous trees or limbs as needed. You don’t need anyone’s permission if the tree is on your property. Use your common sense. If you would like to learn more, contact us today and we will be happy to answer any questions you have! Many people overplay their pruning powers. Consider rethinking why you are pruning. I.E., shade trees need structural pruning. Usually every 3-5 years. If a tree has not been pruned in the past, it may need either corrective pruning (after a storm) or heavier than normal pruning because it has not had any structural work in the past. Thinning cuts are considered a waste of time and clients’ money. The exception would be you need more light at the ground level for understory plants. 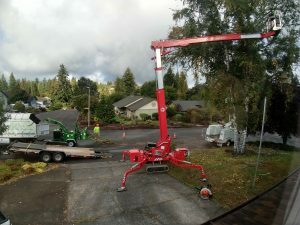 In Vancouver, WA and Portland, OR some Arborists and tree services suggest “wind throwing.” Wind throwing is the selective removal of limbs from the canopy to allow more wind to pass through the tree, and it’s generally not a good idea. Yes, the wind goes through the canopy faster, but it also takes the dampening effect away from the trees. In effect, you create more limb failures. Nature knows what it’s doing. Most fruit trees need pruning every year, I try to prune most of mine in late winter and again in late summer after they have fruited. I try to keep most of my trees under 8’. I don’t need a ladder to pick my trees. Most evergreens I prune after their primary growth surge or after they bloom, (late spring early summer). Winter pruning is not what you want to do with evergreens. Depending on the species and what you want to accomplish, less is more. If you can’t tell if it’s been pruned, you did a great job. If your significant other says, “what in the hell did you do?” you probably did too much. I have done plenty of dumb things to trees in my life, and have learned many lessons. The main thing is if it’s not your skill set, call our tree service at (360) 608-8160. It is better to do it right once, than have to fix it and Arborists know how to do it right! Many people still consider this is a good time to prune and to be honest in our company we don’t take any time off. My point is we still prune this time of year, but it’s not the best time. Here are some reasons. The cuts, (considered wounds) can’t compartmentalize because the sap isn’t flowing. This gives fungal pathogens a longer time to establish themselves on the cut. It is easier to see the limb connections throughout the canopy. If you have the time – go for it. You will want to pick a time that will minimize the stress related to the wounds you are creating. Since new wood is, in essence, feeding the tree why you would want to take away the food reserves of that tree? In spring the system is working the hardest, so making cuts (wounds) is making the system work even harder. Another problem is some species bleed heavily in the spring. Remember the main question – when is the best time to prune? Most growth that is put on by plants is done in the spring and early summer. I have read some literature that makes a case for most plants doing the majority of their growth within the first six weeks of when spring hits. If the weather turns hot, the growth will slow down substantially. Once the growth “hardens off,” this is the best time to prune many plants. The system is no longer working overtime to accomplish all the tasks. Most of the ornamental trees and shrubs have bloomed. You can tell which limbs need end weight reduction. In some ways fall is a good time to prune, the systems are not working hard, everything is shutting down, but many plants form the new flower buds in late summer early fall. If you prune a rhododendron in the fall, you will be pruning all the spring blooms off the plant. One thing to remember, any time you are pruning any tree – you are removing energy from the tree in the form of carbohydrates. Like all living things, trees need energy to survive. They store in the form of carbohydrates. When you remove a portion of the tree, you are removing some of its energy stores. Any cut you make is a wound that the tree must compartmentalize. Every cut should be intentional and necessary. Here at New Day Arborist & Tree Service, we know how and when to prune your trees, so give us a call at (360) 608-8160 and we will be by in a jiffy! Tree Service Tips – When Should I Worry About My Tree? ↑ Tree Service Tips – When Should I Worry About My Tree? To get started on your next project please click below to schedule a free estimate! Book an appointment today! Incorrect planting procedure, and planting the wrong tree in the wrong place can cause a multitude of problems. Let us help you select the correct tree, and plant it properly. To get started on your next project please click below to schedule a free estimate! Sitemap | Google Reviews Washington Lic. #: NEWDADA871PP WA pesticide Lic. #: 78920 Oregon CCB Lic. #: 201733 OR pesticide Lic. #: AG-L1019543CPA Copyright © New Day Arborist. All Rights Reserved.